One of the questions I get asked the most about riding so many coasters is do they scare me anymore? The answer is usually no (although there are some exceptions: looking at you Dodonpa), so it's kind of hard for me to relate to anybody with a gripping fear of coasters when I've spent so much of my time riding and loving them. But for anybody looking to conquer that fear I've put together some tips. These are by no means the 'official' way to conquer a fear but more just a few personal pointers that might help put you on the straight and narrow to getting over your fears and maybe even one day becoming a fully fledged enthusiast! Do your research. I find the more I know about coasters, or a particular coaster, the more it feels like less of an alien concept and with knowledge comes power. You no longer feel so helpless and at the whim of the unknown. If there's a particular coaster you're gearing up to ride then I'd recommend heading over to YouTube and watching some POVs so you know exactly what to expect from the ride. If it's a general fear then look at the cold hard facts: did you know you're more likely to be in a car accident on your way to the theme park rather than at the park itself? And I bet you're not scared of the car journey! It's little things like that that can really help to rationalise everything and put things into perspective. Those most likely to convince you that there's nothing to REALLY be scared of when it comes to rollercoasters are those who love them most! Join a coaster enthusiast forum or Facebook Chat group and ask loads of questions. Chances are there will be people in there who can answer pretty much any question you can think of to throw at them and whose knowledge comes from experience. Make sure you visit the park with people who aren't scared of the ride, but also who aren't going to force you to ride something you don't want to ride. If you go with other people who are equally as scared as you you'll all feed off of each other's fear and make things so much worse. Riding with people who love the coaster has the same effect: their joy will be infectious and you'll soon be wondering what the hell you were ever worrying about in the first place! Fear is part of the fun! Let's get this straight: coasters are supposed to be scary. Not fearing for your life, anxiety and stress inducing scary, but fun and thrilling scary. Fear is good. It triggers the 'fight-or-flight' response which in turn floods your brain with endorphins, dopamine and adrenaline all of which feel really good and make us feel happy! But for that to happen you really have to know you're in a safe environment, which links us back to point one. Understand that you're perfectly safe, relax a little and you'll see how quickly the fear turns to fun! Our minds have a real knack of blowing things massively out of proportion and convincing us things are going to be so much worse than they actually are. 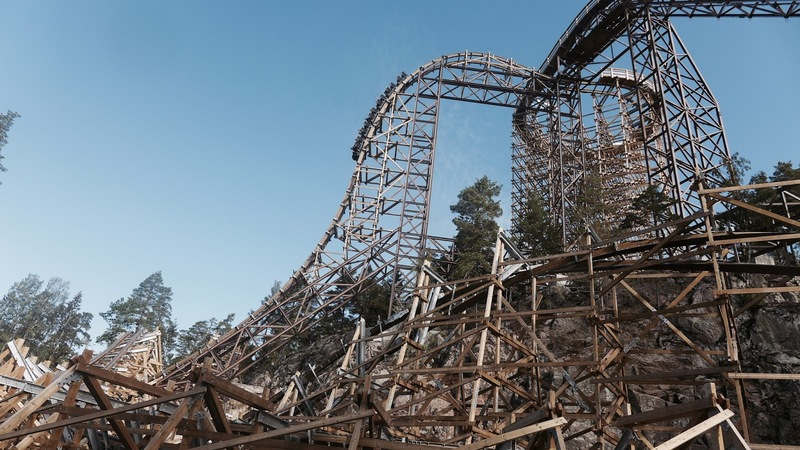 So your brain is probably telling you that terrible things will happen if you ride this coaster and you're probably going to have a really bad time. Try your best to drown that out with positive thoughts: you're going to have fun, these things are literally designed to give you a fun and exhilarating time! Hope that helps. Now, read it, read it again and purchase your ticket. You're ready to ride!